Good morning, Friends! Well, I am leaving today for home. It will good to be home but I will miss my friend! Love her dearly!! And her husband has just been SO wonderful! He made dinners, desserts, served us and cleaned up so that we could focus on sewing and quilting! Now how wonderful is that?! Thank you Larry!! I didn't actually get a Christmas stocking done but I did get a lot of the prep work done for two of them and hopefully will get me motivated to get them done before next Christmas - lol! I am really excited about them! So I will be on the road today. Looks to be great weather once again! Don't forget to sign up for the Spring Collection at Create with Connie and Mary! It's just begun! You will love all the creations that the design team has come up with! Thanks for stopping by and have a super day! 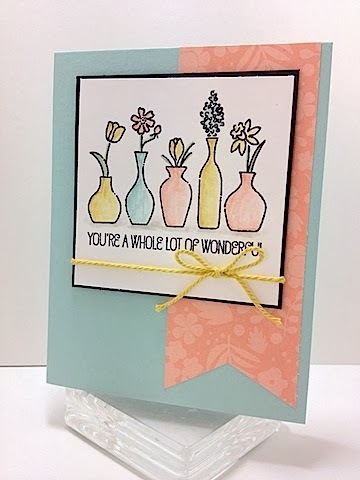 Love the pastel shades on this card Deb.